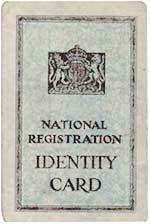 To implement rationing, the British government began issuing Identity Cards through National Registration on September 29, 1939. All persons had to be registered, and once registered, they would return to their local neighborhood office or village hall to receive their ration books. Ration books came in three colors: tan for adults; green for pregnant or nursing women, and children 4 and under; and blue for children 5 to 16 years old. The ration book color scheme insured that each person got the right amount of food for their age or health condition. 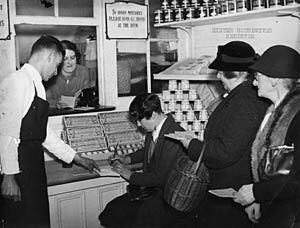 Once the family’s ration books were issued, it was required that the household had to register with their local stores: the butcher for meat and the grocer for general foodstuffs. The shop owners could refuse you, especially if your weren’t inclined to pay your bill on time!